It is often said in design circles that the front door is a house’s handshake. (These are the kinds of things interior designers like to say to each other over dinner.) The size and colour of the door, the choice of lock and bell should reflect what lies within. Yet if the front door is a handshake, the entrance hall is a first date. A well designed entrance hall can be disarmingly charming, yet – like a good first date – strangely elusive, and it’s for that reason that we’ve compiled our top entrance hall ideas so you can ensure the charm doesn’t falter after the first handshake. planting and minimalist picture frames. 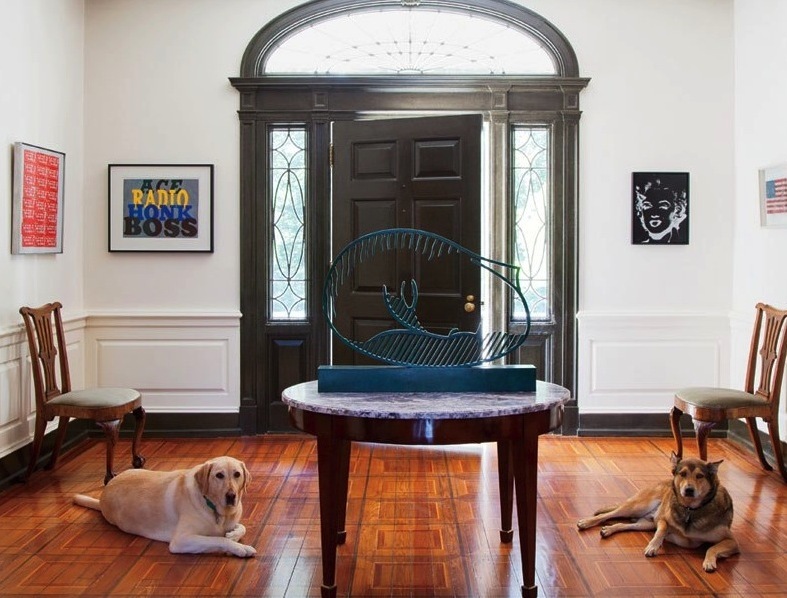 The adventurousness of the house’s decor (which can be glimpsed in the contrasting modern and traditional staircases) is extended right up to the front door to greet all who enter. 2. 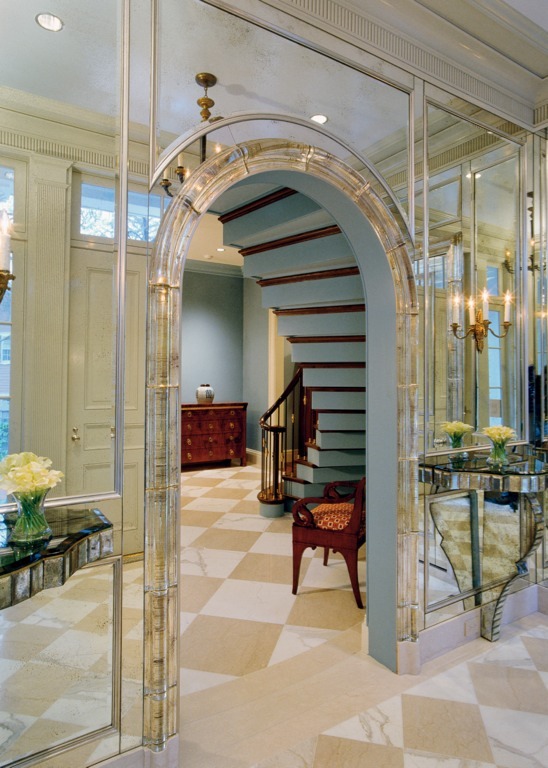 Time to reflect – a great solution for smaller or darker spaces is to install a mirrored wall. A showstopping fitted mirror not only gives the impression of greater space and light, but with the addition of a few strategically placed candles can create some magical entrance hall lighting effects which never fail to make an impact on dinner guests. 3. Hidden depths – due to the amount of foot traffic through this space, maintaining a sleek minimalist look can be challenging. Before you know it a tranquil entrance hall can be transformed into a repository for groceries, gym bags, coats, shoes and other teenage and canine related detritus. However, entrance hall ideas such as these bespoke concealed shelves by our team of interior designers at Clifton Interiors ensure that a modern hallway can be kept looking sharp and sleek. 4. 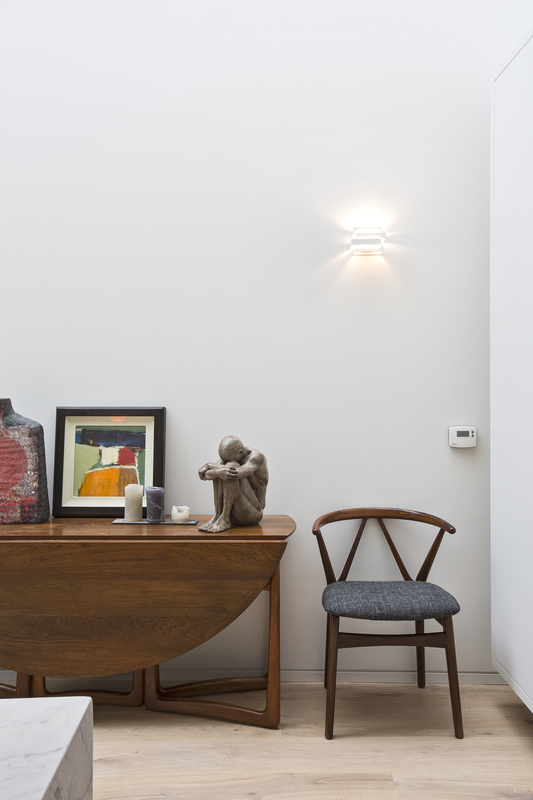 Private viewing – entrance halls make excellent spaces for displaying artworks, especially sculpture. In an entryway paintings can take centre stage, not competing with any large furniture, while 3D pieces are afforded the rare advantage of being viewed from all angles without obstructions. And what better way to welcome a guest into your home than with a quick tour of your artistic interests? 5. All in the detail – the entry to a home sets the tone for what’s to come. Whether you’re a visitor or returning home from work, an entrance hall that greets you with a warm snapshot of the house as a whole is a joy. Some easy entrance hall ideas for finishing touches include candles, sculpture, a favourite eye-catching chair and pieces collected while travelling. 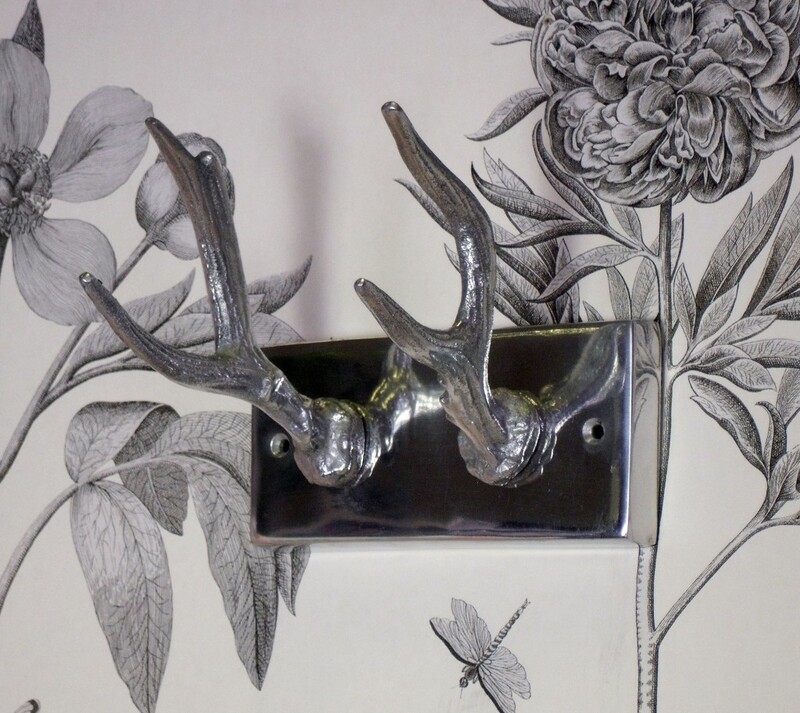 These coat hooks (above) by Belle and Thistle add a touch of irreverent charm, while for this hallway (below) we assembled a collection of our client’s favourite pieces to bring the unique character of the house and their personal taste right up to the front door. 6. Bring Flowers – As with dating, flowers make a great first impression. It may sound obvious, but organic matter brings a space to life. Unruly natural shapes and vibrant colours can brighten a tranquil entrance hall design and give it some real wow factor. So have fun with some unusual stems, colours and containers to really stop your visitors in their tracks. Who knows, you might even nab yourself that second date. 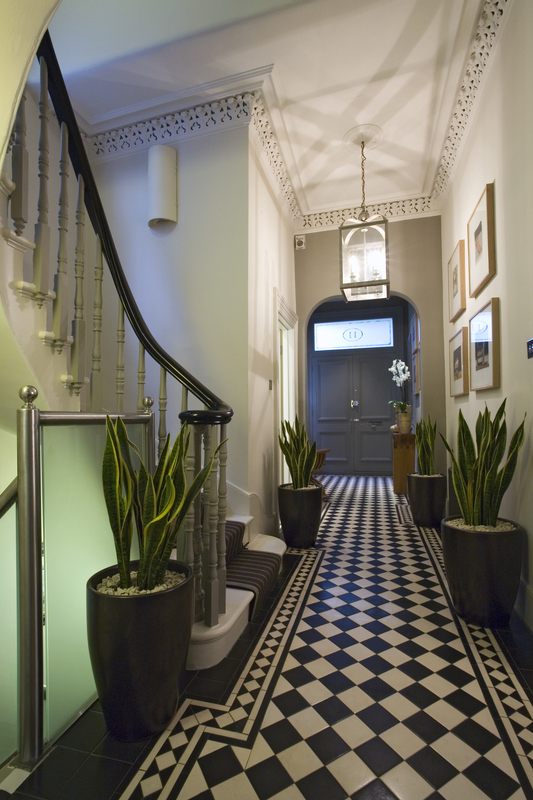 Clifton Interiors is home to an expert team of London interior designers. Give us a call today on +442075865533 or email us at info@cliftoninteriors.com. Alternatively, leave us a comment below and we’ll be sure to reply.